Delightful Designs by Danielle: Up, up & away ... in my beautiful balloon! Up, up & away ... in my beautiful balloon! Thanks for stopping in today. I have made this masculine card for my hubby's birthday which is coming up at the end of the month. Look at me, a whole week to go and I have his card ready - that has to be a first, lol!!! Anyway, this is a new stamp set which I found in the discount bin in AC Moore yesterday for $2.99!! It's a set byTCP Studio and I love it, especially for these ever-so-hard male cards!! The paper was a super little pack for $1 by Studio G. The cloud background is another newbie to my collection, a Darice embossing folder. I paper-pieced the balloons for extra detail and colour. The sentiment is part of the set too. I finished the card off with a twist of twine. 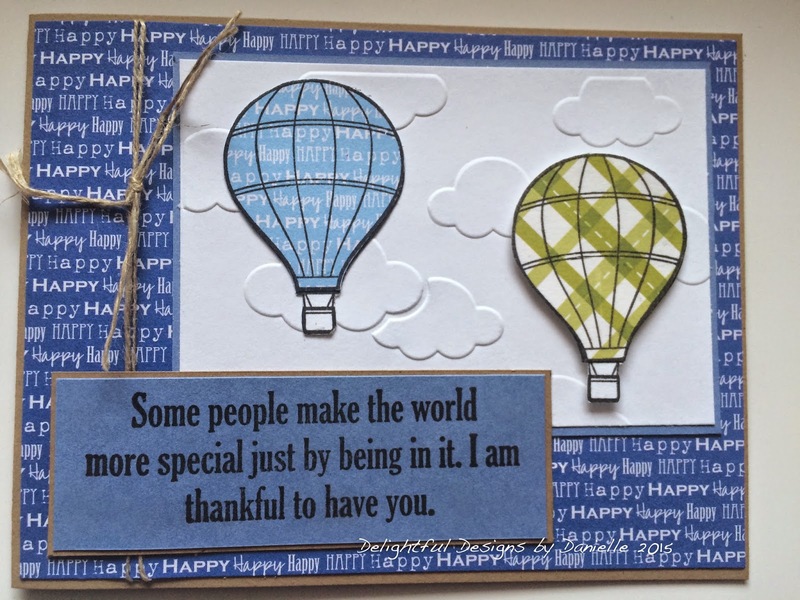 I am entering this card into Craft Your Passion Challenge where it is always Anything Goes! Also, Crafty Calendar Challenge where the theme is Something New (paper/stamps). Great to see you here and I hope you're able to take a minute and leave me a comment - I love to hear your feedback! Beautiful card. Love balloons. Thanks for joining us at Craft Your Passion. Hope to see you again next week. Super card for your husband.Such a great design. Gorgeous card. I love the balloons. Thanks for joining in our 'What's New" challenge at Crafty Calendar this month. Ballerina Tilda ... and Jasper in the snowstorm!